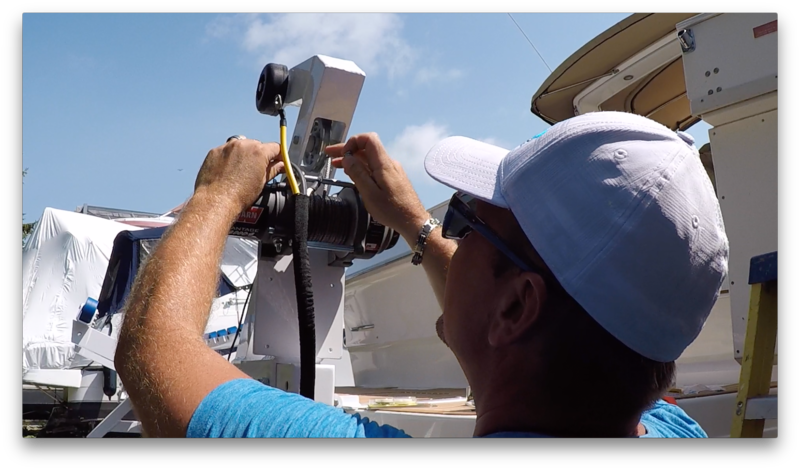 Have you ever been shopping around for something for your boat and thought, “I should just make one myself, that way it would be exactly what I want and I wouldn’t have to settle”? Me too. Have you ever taken the next step of designing, engineering and constructing a prototype for it? Me neither! Blu Gagno, on the other hand, is an outlier. He did exactly that when he couldn’t find a tender lift that worked for him. Sure, what he saw on the market worked, but the engineer in him enjoys problem-solving. The result was a pivoting and tilting tenderlift, similar to hand winch models, with much of the ease of hydraulic lifts at a fraction of the cost. But, like the old adage from Ralph Waldo Emerson that I heard in business classes 20 years ago: build a better mousetrap and the world will beat a path to your door. “We were sitting out at an anchorage one weekend and a friend was beside me and he said, ‘why don’t you build one of those for my boat,’ and I said ‘sure.’ Then another friend asked,” Gagno said while working on an installation at Hindson Marina in Penetanguishene, Ontario. That was four years ago. 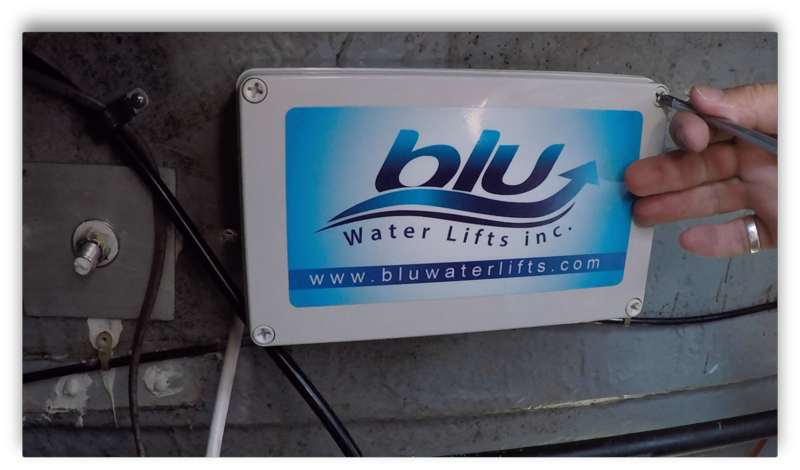 Now BluWater Lifts is another one of Blu’s businesses. One that keeps growing year over year. He designs pretty much everything himself, other than the winch that pulls the dinghy or PWC up onto the cradle. He found Warn winches worked well and were rugged enough that he didn’t need to reinvent the wheel. Instead, he just needed to re-wire it to work from a remote control. The cradle itself is fairly standard. There are a few sizes available depending on what you want to hold. But the davits and stanchion supports vary based on the strength of the platform you’re mounting on. The more boats Blu works on, the bigger the knowledge base he has to work from. The first platforms meant measuring out every aspect of the swim platform and investigating the transom to see where everything could be mounted, but now he has a good chunk of the more popular makes and models already measured out. Cruisers, Sea Rays, Carvers and the like. 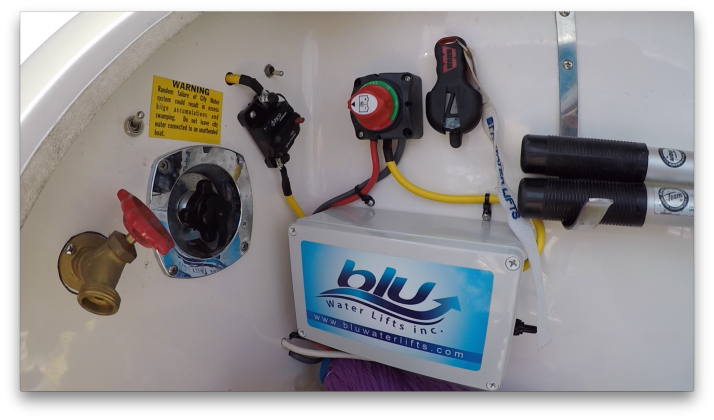 You can DIY the install if you’d like but most people opt to have Blu do the installation. It can be a daunting project to mount something this big even though it’s fairly straightforward. 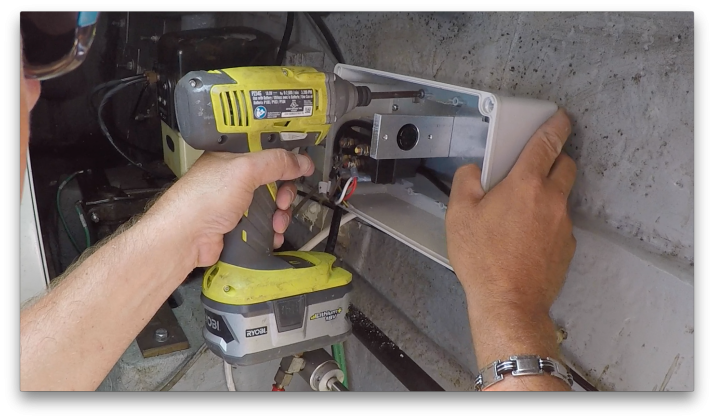 Other than when mounting the unit itself, you only need to drill one hole and it’s for the wiring. 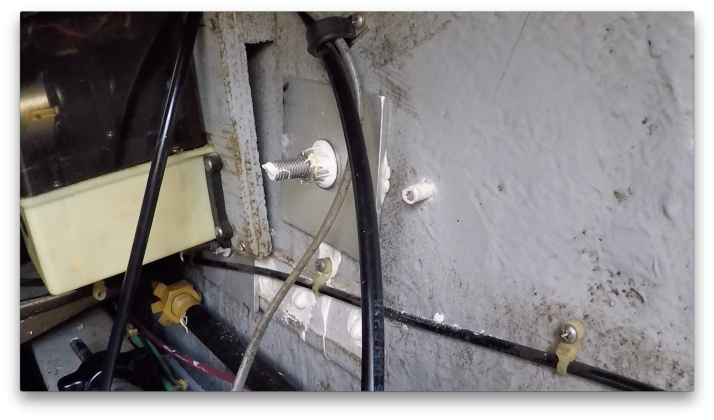 The wires run from the winch and the single motor that lowers the unit into the water into the boat to the control box. 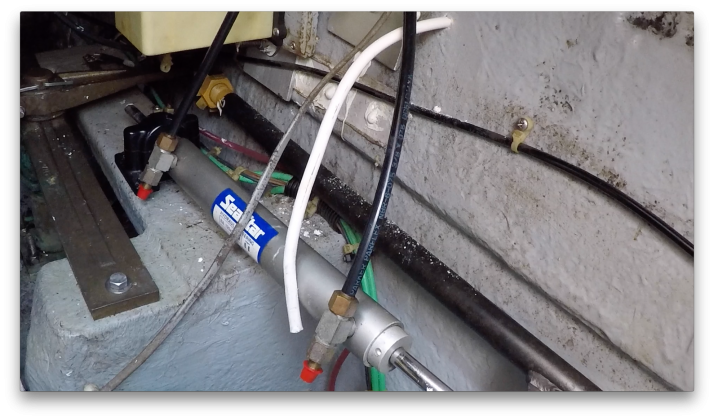 Cable clams and silicone seal that back up to make everything nice and watertight. Then the wires can be secured and tucked away under the platform for a nice clean mount. 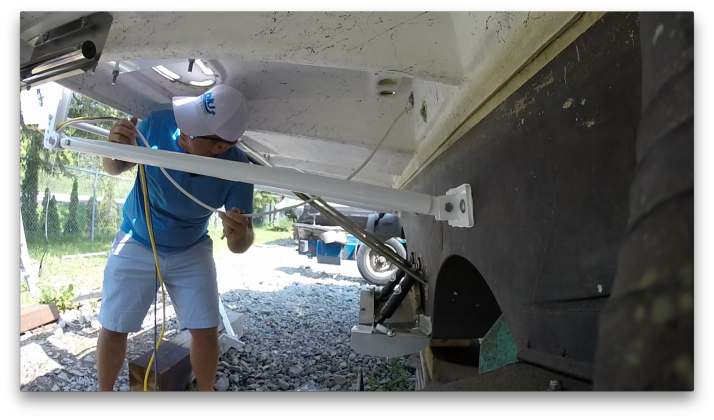 The control box itself — the brain of the operation — is generally mounted in the transom hatch so it’s out of the way, but still close enough for easy access. As is the battery switch so you can turn it off to make sure there’s no drain if you won’t be using it. The remote is, like the overall concept, very straightforward. Just up and down arrows. The design does the rest other than lowering the arm along the centreline of the cradle with rollers to guide your tender up. Walking around the marina on a sunny summer day he proudly pointed out a half dozen of his lifts that had everything from PWCs to a RIB with a 40-hp outboard on it. Then he took me to his boat to show the lift in action and how it looks while underway. The tender sits nice and high out of the water so getting up on plane is no problem nor is dropping it back to idle. The rush of water and wave that comes up and over the swim platform in a drastic slow down barely touches the tender — if at all. If you’re in massive seas with 10-foot waves, you will have to take it off and tow it behind. That’s fairly standard with most lifts. 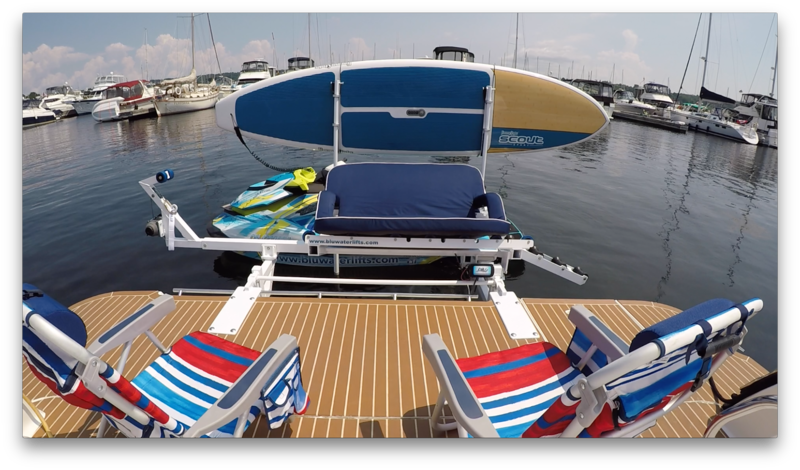 It’s not removable so it will always be on your boat, but when not in use as a tender lift don’t think it’s just a big white elephant in the way. Gagno puts a folding, hard backed, soft cushioned bench seat on it and has an outdoor lounging spot. He’s also recently added a stand-up paddleboard holder as an option. But seeing how good the bench seating idea works, I’ve got a “serious” problem with it: No cup holders. 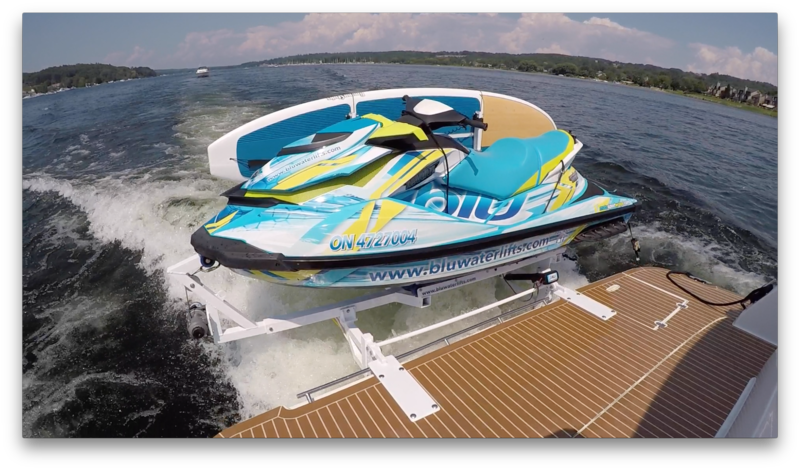 If you see cup holders on BluWater Lifts this summer, know that yours truly helped up the game of an already impressive success story from Central Ontario! Previous articleReady for the road? Next articleLegend Boats Boat Show Savings Event on Now!